Before the dawn, Mary and the women came and found the stone rolled away from the tomb. They heard the angelic voice: Why do you seek among the dead, as a man, the One who is everlasting Light? Behold the clothes in the grave! Go and proclaim to the world: the Lord is risen! He has slain death, as He is the Son of God, saving the race of man. O Christ our God, though Thou didst descend into the grave, yet didst Thou overthrow the power of Hades, and rise as an immortal conqueror: Thou didst greet with joy the myrrh-bearing women, and to Thine Apostles hast sent Thy peace, and to the fallen, O Lord, didst bring resurrection. In the grave bodily; in Hades with Thy soul, though Thou wast God; in Paradise with the thief; and on the Throne with the Father and the Spirit wast Thou who fillest all things, O Christ the Uncircumscribable. How life-giving, how much more beautiful than paradise, and truly more resplendent than any royal palace proved Thy grave, the source of our resurrection, O Christ. Rejoice, O sanctified and divine tabernacle of the Most High; for through Thee, O Theotokos, joy is given to them that cry: Blessed art thou among women, O all-immaculate Lady. Glory to the Father, and to the Son, and to the Holy Spirit: both now and ever, and unto ages of ages. Amen. More honorable than the Cherubim, and beyond compare more glorious than the Seraphim, thou who without corruption gave birth to God the Word, the very Theotokos thee do we magnify. Blessed art Thou, 0 Almighty Master, Who hast enlightened the day with the light of the sun and hast illumined the night by the rays of fire, Who hast deemed us worthy to pass through the length of the day and draw nigh to the beginning of the night. Hearken unto Our supplication, and that of all Thy people. Forgive all of us our sins, voluntary and involuntary, accept our evening entreaties, and send down the multitude of Thy mercy and compassions upon Thine inheritance. Encompass us with Thy holy Angels; arm us with the armour of Thy righteousness; surround us with Thy truth; protect us by Thy might; deliver us from every grievous circumstance and from every conspiracy of the adversary. And grant unto us that this evening together with the coming night and all the days of our life may be perfect, holy, peaceful, sinless, without stumbling and vain imaginings; by the intercessions of the holy Theotokos and of all the Saints who, from ages past, have been well-pleasing unto Thee. Amen. And likewise again: Christ is risen … (3). Know that from the Holy and Great Sunday of Pascha until the Feast of Pentecost, the introductory prayers, Glory to Thee, our God, glory to Thee. Heavenly King, O Comforter … are not said. 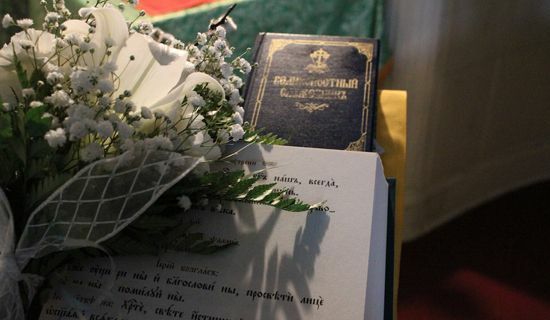 And from the Holy and Great Sunday of Pascha until the giving up of Pascha on the eve of the Feast of the Ascension, in place of Holy God, Holy Mighty, Holy Immortal … and a come, let us worship … we say, Christ is risen from the dead … (3).